Listed below are lots of ideas of ways that you can help support Mollywood Avian Sanctuary. Make online purchases from your favorite stores and a percentage will be donated to Mollywood! Learn more. Or just start shopping! Volunteers are the lifeblood of animal rescue. Can you set aside some time to help in the rescue process? There are many ways in which you might be of service. If you are interested, please fill out the volunteer application and return it to the sanctuary. Each day each cage must be cleaned thoroughly. Each cage is sterilized and bedding is changed. Floors are swept and laundry is done. Kennel Attendants may also be asked to help provide food and water for the birds. Each month Mollywood holds a volunteer weekend. These weekends usually consist of taking care of large projects like building aviaries and clearing out spaces to put them. Please contact Mollywood for future dates. If you have experience in grant writing this might be perfect for you. There are many corporation, organizations and charitable foundations with grant money available. This can be done in your home in your spare time. This involves picking up animals from all over the state of Washington. Also you may be asked to pick up donations of pet foods and supplies. Sometimes we have as much as a day's notice, sometimes we need a driver immediately. A foster home must be able to provide a safe, warm place isolated from other pets. The birds need lots of human contact to help develop confidence and social skills. Supplies such as pellets, cage paper, water and toys are generally supplied by the foster home. You must volunteer at Mollywood to qualify as a foster home. Please email us to enquire further. Fun ideas for kids. Click here to see how you can make a great, inexpensive bird toy! There may be other ways you'd like to help out. Tell us what you're good at and how you'd like to use your talent. Due to storage limitations, rather than donations of Fresh Fruit and Veggies, we would prefer cash cards to Costco or Safeway so that we can purchase what our birds eat as well as what we can store without food going bad. 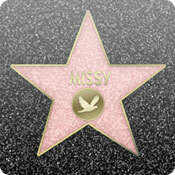 Click a name or a star to see one of our birds. You can choose to sponsor the one you like best! 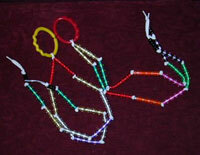 Every one of the birds at Mollywood love these bead toys. The only problem is, they seem to dismantle them faster than we can make them. Here is how you can help. You can make the toys yourself! They are easy to make, just follow the instructions below. * Wood beads are acceptable provided that they are natural wood and not lacquer coated or painted. Take one shoelace, and tie it securely to a fun link. The best way to do this, is to thread a fun link onto a shoelace. Holding the ends of the shoe lace, with the link hanging in the middle, tie a square knot, tightly around the link. 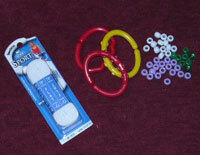 Thread 9 beads onto one shoelace. 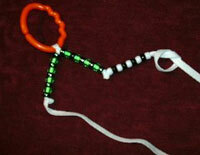 Pull the beads all the way down the shoelace down to the fun link. 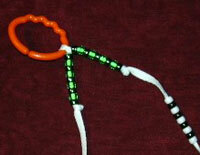 Tie a knot as tight as you can and as close as you can to the beads. Tie it twice so the birds have to work to get it untied! Thread on 9 more beads, tie another knot, and repeat! Do the same for the other shoestring. Send them to Mollywood for your favorite bird!